After much deliberation I’ve finally selected my five images for this year’s ‘Capture The Colour 2013’ Photo competition staged by Travel Supermarket. All five of these awesome blogs are fun and interesting and if these guys don’t make you just want to get off your couch and hit the road, then nothing will. Thanks guys, and thanks to all you travel bloggers out there in the blogosphere. 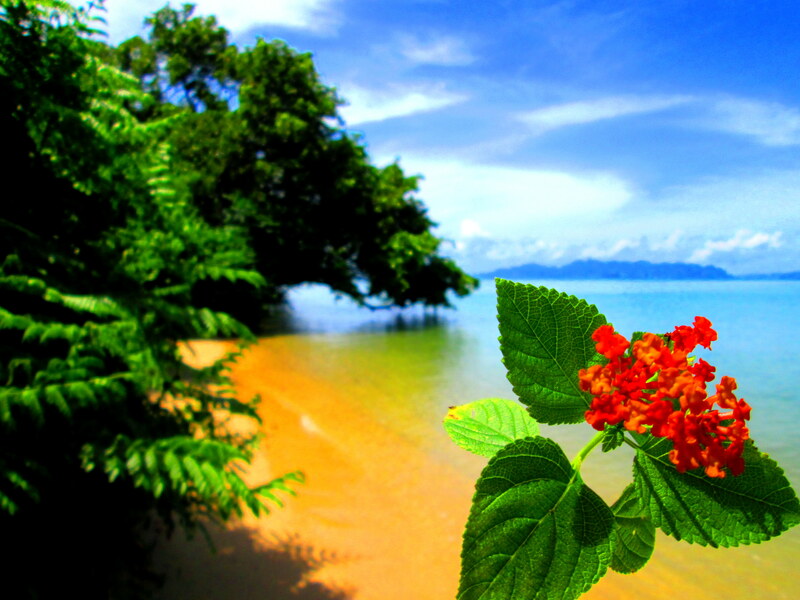 Red– The beach you see is Had Yao on the island of Koh Yao Noi, Thailand, my home for 4 months earlier this year. It’s an isolated and little known stretch of paradise and just happened to be 10 minutes from our house. Happy days, especially when a beautiful red flower adds contrast to the perpetual blues, greens and yellows. Yep, they were tough days! Blue– A couple of years ago Leslie and I went on a quick trip to Morrocco, and traveled to the desert town of Ben Ait Haddou. This area is famous for staging some well known scenes from blockbuster movies, such as Gladiator and Kingdom of Heaven among others. Up in the dusty lanes of the tiny hillside village we came across this dazzling scene; the terracotta pots themselves are spectacular, but to me it’s the purest of blue skies beyond that makes the contrast so special. Green– Had Yao Beach was full of surprises, the biggest of which was seeing another human, though we were often joined by technicolor horn-bills or six foot monitor lizards. 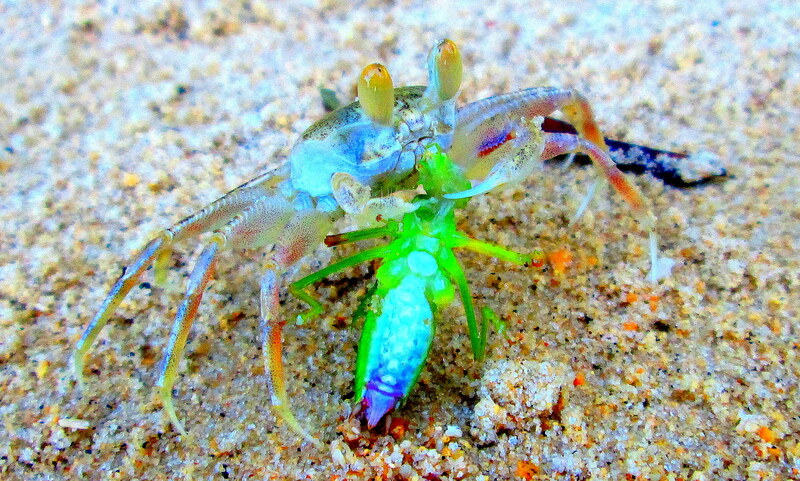 But on this particular day a small crab came and showed off his lunch. I fully expected him to scuttle off as I took out my camera, but not this brave chap. He simply sat and posed for a bit, before casually edging up the beach to chomp on his cricket. Tasty. Yellow- After we visited Morocco we continued our trip into Egypt. Here at the magnificent Temple of Karnak in Luxor, around every turn amid the towering columns and ancient stones we stumbled upon little vignettes of life in the beautiful natural hues of Egypt. Here these two old guys are oblivious to us, deep in conversation, presumably about whose turn it is to buy the tea. Their blue and orange garments punctuate the rustic yellow stones spectacularly, and offer us a stunning glimpse into antiquity. 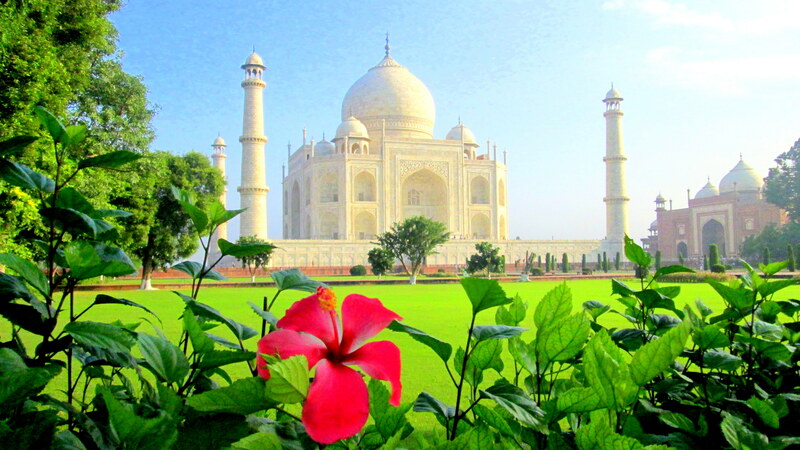 White– And last but not least, the simply sublime Taj Mahal. Leslie and I are in India right now, and this magical country offers up a world of experiential travel opportunities, not least photography. And photographing the Taj is an easy task, as it is quite simply architectural perfection. My worry was that it’s too obvious, a cliche of a picture. But with the bright red flower in the foreground, and the verdant greens and dusky blue skies as a back drop, I feel that I’ve truly captured the colour of white in this shot. I hope you agree. So these are my entries to this year’s competition, my first attempt at entering my photos anywhere. I wish all the other entrants the best of luck, and I can’t wait to see your images. Cheers guys, and good luck. Lovely colors! And the Taj is pretty hard to photograph without taking the same photograph as everyone else, but I think you did a good job! Thanks a lot, but I think red is my fave as it’s from the beach by my old house. I’m going to say Red is my favorite. Congratulations on your trip to Australia.